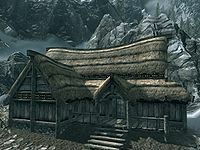 Helgen Homestead is a small inn located in the town of Helgen run and owned by Vilod. 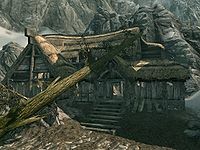 The first time you see this building is right at the start of the game, when you are brought down from the carriage you've traveled to Helgen in. It is the building directly behind Hadvar as he marks off the names of the prisoners on his list. This is the second structure you enter after the dragon, Alduin, interrupts your beheading. Climbing up the stairs of the tower fortification, the dragon explodes through the side of the tower. You are urged to jump into the building below through the hole in its roof. It has two floors. On the upper floor are two non-interactive beds, two set of shelves holding clutter, one of which has been knocked over, one table with an overturned chair, three food barrels, and five loose bottles of mead with juniper berry. Since your hands are still bound when you enter the house, there can be no interaction with surrounding items. There are no steps or ladder to the ground floor, and you must jump down from the east end through a large hole in the floor. The ground floor contains two tables with over-turned chairs, one wardrobe, one end table and one unowned double bed. The building has several openings you can enter through; a northern door and several holes in the northern and eastern walls. 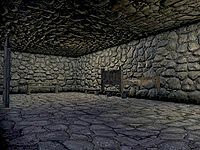 You exit this building and join Hadvar or Ralof for the remainder of the first quest. Upon returning, you will find at least four bandits have occupied this southern end of Helgen after the town has been abandoned, three in the homestead and one at the top of the tower you initially escaped through. If you enter from the north, you'll find additional enemies. The building can be approached directly from the mountains to the south of it. On the large wooden table you will find a random potion of healing and one of strength, as well as a large coin purse. You can sleep in the double bed on the ground floor if you have defeated all the bandits in the area, including the one at the top of the tower. You can also then fast travel directly from the building. During the initial quest, Unbound, Ralof mentions Vilod, who makes mead with juniper berries. You can find these on the second floor. If they are not there, return after traveling for at least a day and check again. The enable for the bottles wasn't set correctly, so they don't appear as you run through during the introduction. The building can serve as a "home", since it has two safe containers and an unowned bed, if the player does not mind disposing of the respawning bandits. Using the console command (coc HelgenHomestead) will take you to a small room with a table, two benches, a floating bed you can sleep in and a door not connected to the wall. There is no other way to enter this small room. The door may lead to the porch of Helgen Homestead or "off the map". This version of the Helgen Homestead can still be accessed from the main overworld, but you still need console commands to do it. If you use the "player.coc" console command to teleport to anywhere in the main game directly from the main menu, you can then fast travel to Helgen (which is already automatically enabled for fast travel), and enter the section of Helgen that is intact before Alduin levels it. From there, the building that is the Helgen Homestead is still intact, as is the door that takes you to the interior Helgen Homestead cell. This is actually the door that Haming enters at his father's insistence when his father won't let him watch the soldiers. This page was last modified on 1 February 2019, at 09:28.